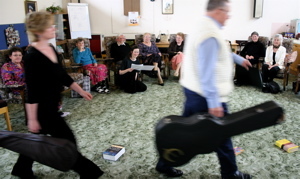 A group of local Hastings and St. Leonards-on-Sea residents came together to take part in a performance based on their memories and stories. This event was the culmination of a Creative Reminiscence project for people over the age of 60, run by Shaping Voices Arts Company in conjunction with the WRVS. The project has been funded by an Awards for All Lottery grant which has enabled members of Shaping Voices to work for several weeks with a group of enthusiastic people aged from 62 to 92. Through a series of weekly creative group sessions participants’ memories were transformed into stories that are touching, highly visual and often extremely funny. The performance, given by members of the group and of Shaping Voices, included elements of singing, acting, dancing and poetry. Mrs Mop & Esther plied their trades. out of my hands, the taste of gas on my tongue. for a short holiday in Mexico. for a job as a bandit and decided to stay. Filled it with vibrant young women. One night at the beginning of autumn there was a huge storm and many animals were injured by falling branches and their homes ruined. The stag, who had taken off his crown, forgot himself in his urgent need to help. He moved branches and he carried small animals to high ground. He laboured all night. In the spring, as the forest began to bloom and grow, first his wife and then all the animals noticed his good looks and bending down to drink he saw, reflected in the pool, small horns coming from his head. Each year they grew grander until in his great old age, as he increased in wisdom, he bore on his head the most splendid set of antlers, like the branches of an oak tree.